OBJECTION!! What can we say? We’re eagles and we are definitely opinionated (Not to mention always right!). So, of course we are going to have a debate section in our wonderful Common Room! But if you haven’t visited the Roost in a long time, and you are just so confused about this…You should really check it out! The club was founded by 4 wonderful Ravenclaws; Rosanna Gullveig, Maya Winters, Adeliene Cromwell, and Faye Laramie/Leah Samson. These three ladies’ brains went into action to come up with something new to add to the Roost. Well as you can guess they created the Debate Club! The Debate Club made its grand entrance during the cold days of December 2007. 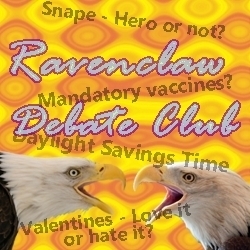 What a better way to keep the Ravenclaws busy then getting them all into a debate. (Other than Dr. Who and other random fandoms they all shared). Being the Prefect in the bunch at the time, Maya Winters became the very first head of this budding new section. Rosanna took over the main leadership once Maya decided to pursue Professorship. The whole goal was the get Ravenclaw’s to express their thoughts and opinions on different topics that weren’t too controversial. The Debate Club section was a hit! Ravenclaws from around the world and even some students from other houses began debating various topics and bored students can still be found reading through the opinions of their fellow students. As of today, the section has been up kept and debates are still posted monthly. The Debate Club has also become part of the Ravenclaw Activity Point System (Sapphires), to encourage even more students to participate. But if you ever get a chance, you should definitely head on over to the section, as it is open to all houses, and debate your little heart out. Because who knows, your opinions might just change the way someone thinks!